Thousands of supporters across Australian Catholic schools and parishes have joined in solidarity with the world’s poor by donating more than $10.8 million to Caritas Australia’s Project Compassion campaign. Held annually over the six weeks of Lent, Project Compassion raises awareness and funds to address extreme poverty and promote justice across the world. 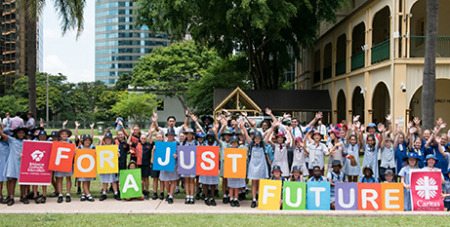 This year’s Project Compassion theme of “For a Just Future” highlighted the role that young people have to play in the solutions to the challenges facing their societies globally. Caritas Australia’s Chief Executive Officer, Paul O’Callaghan, thanked supporters and communities across Australia for their support. “Lent is the time of year when we put our faith into action through prayer, fasting and almsgiving,” Mr O’Callaghan said. During Project Compassion, the stories of young people from Nepal, Cambodia, Jordan, Australia, Mozambique and the Philippines were shared. Money raised during Project Compassion goes towards Caritas Australia’s humanitarian and long term development programs in Africa, Asia, Latin America, the Pacific and with Australia’s First Peoples. Last year, Caritas Australia reached over two million people directly.